And so, the end of the journey has come for The Swords in more ways than one. It wasn’t hard to predict the direction it was inevitably going, or the likely Outcome. The scene that lies before us in The Ten of Swords is indeed shocking. It was designed to be so, and disturbs us greatly when it appears in our Reading. It is the culmination of the continued, ongoing chronic stress and conflict The Swords endured, or brought upon themselves from the moment they headed off at The Ace. The Element of Air is very powerful indeed and needs to be harnessed and disciplined if it is to be of any positive use to us. The Sword’s fate seemed sealed from the outset as they quickly lost control of their Element in the Two. They had been gifted one of the most amazing and fascinating Elements of all, but it was complicated and tricky. The Sword if held the wrong way could hurt or kill. Double-edged, both sides needed to be mastered before it could be properly utilised. This was an expertise not all could achieve and many fell into the trap of learning to use only one side. Depending on which side was used, The Sword falling into the wrong hands became dangerous and destructive, not only to others, but also to who bore it. The Sword had a tendency to turn inwards, when the hand that held it was weak or vulnerable. The Sword had a mind and power of its own, and if left to its own devices, flicked back and forth from one edge of the blade to the other. If it was not used, neglected or abused, it went to work regardless, in search of someone or something to plunge itself into. As a result many victims fell under its weight and felt the sharp cold taste of steel as it pierced their minds and heart. However, wherever the Sword ventured to wreak havoc or damage, it always returned to its owner whether wanted or not. Then it would turn inwards upon the owner, or hang precariously above their head, as they tried to sleep or go about their business. They multiplied over time and the stronger they became, the more uncomfortable, nervous and agitated their owner became. As they multiplied they became more active and restless. Not a moment’s peace was to be had for they were constantly there poking, jabbing and piercing. The pain they inflicted of course was not always visible on the outside for they were clever in how they went about their work. Instead they tortured the mind over and over in an endless assault. They fed on distress, conflict, worry, stress and paranoia. They caused insomnia and exhaustion with their constant negative chatter and demoralising inner comments. They enforced pessimistic views of the world and of those around. They sliced away at self-belief, self-worth and self-confidence and in their place instilled self-doubt and fear. They hacked wedges out of the heart, carving deep ruts into love and emotions. On and on they went, driving their owners out of their minds and emotional stability. They were relentless in their attacks and constantly found new ways to cause distress and suffering. Tormented and powerless, their owners had crazy notions of escaping from their Swords and hatched wild plans to run away from them. They crazily believed that their Swords were apart from them and not of them, that they could sneak away from them leaving all their troubles and worries with them. If they could just get away from their Swords, those separate things that were causing all the trouble, then they would find peace of mind and be at ease. They thought it would be that simple and in the Six of Swords we watched them try to put distance between them and their troublesome Swords (conflicts and stresses). However, as we watched the hopeless trio quietly sail away in the Six, we couldn’t help but feel sorry for them. There, travelling right beside them were the Six Swords they thought to be outrunning. Maybe we should have called out and warned them of their unwelcome cargo, but it is doubtful they would have heard us for they were convinced they had found a solution to their problem. So we let them slip away, oblivious to the fact they were taking their problems with them. We hoped they would get a bit of respite before they became aware of their Sword’s presence once more, at least enough time to regroup and recharge their batteries. How disappointed they would be to discover that no matter how far they had run, their Swords had matched their pace. No matter how clever their plan to escape and conceal their whereabouts, their Swords would always Outsmart them. They did make an attempt to come up with a new plan in the Seven of Swords, to strike back and find a solution to their problems, but they were already gone too far and finding a way out would involve sustained effort on their part, and not just a short-lived display of determination and grit. However, it did show us that it could be done, if only they could learn to turn their Swords around and use them in a positive and constructive manner. Trying to make a stand in The Seven, was all too little too late. Unlike the other Three Suits, who equally were presented their own Elemental Gift in The Ace, and then went happily on their way for some time before encountering problems, The Swords, upon departure from The Ace, immediately fell into crisis in The Two. Unsure as to how to use their Sword when with difficult decisions, they panicked and froze, blocking movement of their precious Element of Air. With their Swords crossed at their heart, they made their first mistake. Instead of facing their fears and using their double-edged Sword (mind) to find a balanced solution and then vocalise it, they shut down and became confused. Terrified by their dilemma and what was being asked of them, they placed a blindfold upon their eyes and refused to deal with it, hoping it would ignore them and go away. Internalising their issues, it was then they lost control and gave away their power to the darker blade of The Swords. Turning sharply and deeply inwards into their owner, they began to twist in their mind. It could all have been so different if they had just trusted their ability to use their Sword wisely instead of being afraid of it. The lighter blade of The Sword is very powerful and would have provided sense, logic, reason and understanding. If it had been allowed, it would have offered a solution to the crisis or dilemma, a way forward. It would have provided clarity of mind and judgement in all matters. It would have looked at both sides of the story or situation in an objective manner, instead of focussing on just one. The lighter and brighter edge of The Sword would have encouraged communication of any worries or stresses to others, or opened the door to negotiation and reconciliation. It would have spoken out in favour of justice and fairness for all, and fearlessly exposed abuse and corruption. It would work tirelessly for its owner, encouraging assimilation of knowledge and learning. Its natural curiosity would have made them relentless in the pursuit of truth and the facts of the matter. The lighter blade of The Sword would have empowered them in the written and spoken words, words that would have a profound effect on others. With, the lighter blade of The Sword they could have flown high, into the sky and space beyond, for the power of a brilliant mind is limitless. They could have risen above their situation and sought higher ground where issues could have been viewed in their true perspective, and not created out of wild imaginings and twisted beliefs. The Lighter and brighter edge of The Sword would never have used its blade to hurt anyone or anything for it would have sought ways to end suffering and heal wounds. It would never engage in bloody, violent battles or use aggression to achieve its aims, for it knew only of peaceful ways to solving conflict. The lighter edge of the Sword stood for law and justice for all, never would it entertain ideas of being above the law or seek to break it. Alas, they fell deeper under the spell of the Sword’s dark blade in The Three of Swords when pain and grief overwhelmed them. They were already psychologically in a bad way after The Two, so it was doubtful they would come away from the energy of the Three unscathed. And so they picked up their Third heavy Sword, added it to the other Two, and their mental burdens began to weigh heavy. They tried to go about their business, continue on their journey and keep up some sort of normal face for those around them. However, the signs of distress began to become visible in the Four of Swords and others began to notice that all was not well. The effort of trying to keep going despite the growing turbulence in their mind burdened them with another Sword in the Four and their knees gave way beneath them. Unable to cope, they were forced into rest and retreated to their bed, or to a hospital to be treated. Mental and nervous exhaustion seeped through every cell in their body and wiped out any fight that was left in them. They could do nothing but lie there and try to heal. No one knows how much time they spent in retreat and withdrawal but it did take much time for them to be strong enough to face the world once more. Still fragile and vulnerable, the Sword’s person was discharged from hospital, medical care or left his place of rest. He then went straight from the frying pan into the fire in the Five of Swords as all hell broke loose in his situation. He either flipped and lost the run of himself and his mind or he came under vicious attack from others. One way or another the scenes from The Five of Swords were shocking and upsetting. Many got hurt on one level or another, leaving terrible tension, anger and upset among all. It certainly was not the environment for the recently exhausted Sword’s person to be in, for they were not mentally strong enough to deal with such negativity and brute force. It was this episode of trauma that made them run for shore in the attempt to escape their predicament in The Six of Swords. We know they should really have stood their ground and dealt with their problems instead of running, but it was their way of dealing with it and probably the only thing they could do at the time. It did buy them a bit of respite from the acute turbulence of their situation and gave them a chance to catch their breath and calm down. Thinking on their feet and taking some action for the first time in The Seven of Swords gave us some hope that The Sword’s person could make a comeback and rise above his situation but he quickly lost power and any ground he had gained in The Eight of Swords. His stab at courage and bravado could not be sustained and his dark bladed Swords began to breed once more. He had so many at this stage he felt trapped by their presence. No matter which way he turned they were there, threatening and dangerous. He felt like a prisoner as the walls of his mind began to close in on him. It went wild trying to come up with a way out of his dilemma but The Swords continued to close in on him and his mind became paralysed with all types of fears; some real but most born out of his twisted, dysfunctional and tortured mind. Believing there was no way out for him, he pulled the blindfold on once more for he did not want to see anymore. He thought it might block out all the terrors but all it did was internalise them further and remove any trace of light from his existence. He was alone in his torment and locked into his mind. He believed there was no escape and no options open to him, no way out. He also believed he had no power and was helpless. If he could only have grabbed hold of those Swords and turned them around to the lighter and brighter blade, he would have had such wonderful positive power available to him. They would have severed any bonds or chains that tied him down without inflicting pain or distress. They could have freed him and mended him. He could have found peace of mind and a way to live in a normal world, and a way to cope with the worries and stresses we all must face. Sadly it was not to be. Bereft at how to help him or get him to help himself, we could only stand by and bear witness to his continued torment in The Nine of Swords. Truly we were all tired of this ongoing saga and drama. Would it ever end and if it did, where would that be? Surely he should have made some progress at this stage, but he certainly hadn’t helped himself or made it easy for anyone else to help him. In The Nine of Swords it was clear that he was losing whatever was left of his mind. He was beside himself with torment and worry. Yes, it was true he had some terrible things to worry about, troubles that none of us want visited upon us, but a lot of his worries were all in his mind and not based on reality at all. He had blown a lot of things out of proportion but there was not talking to him. His now, ever-growing number of Swords had come between him and his sleep. He could get no rest, lie down or even leave his room. His mind had descended into a very dark room and he refused to seek help. He wouldn’t talk about his problems and kept them buried inside where they ricocheted back and forth in his mind, doing back flips and cartwheels. Such were his woes, he rambled and cried, sobbing bitter tears into his hands until we could take no more. We still felt very sorry for The Sword’s person and ran back and forth, holding his hand, offering soothing words and trying to make his life easier. On the other hand, there were an increasing number of us who had grown tired of his constant whingeing and moaning about how hard his life was. We were fed up with having to listen to the latest drama or crisis that was constantly besieging his life. We all had our own problems to deal with, our own worries and stresses, but it appeared none had such a heavy cross to bear as he. He should have sorted himself out a long time ago, but instead let it all get out of hand. He is now in a right mess and incapable of thinking straight. He will have to pull himself together for we can no longer help him. We have our own lives to live and he will have to find a way to live his. He needs to start taking some action, some real action. He needs to face his fears for they are obviously not going to go away at this stage in the game. If he could just get out of the bed, have a shower, get dressed and pull back the curtains he might feel a little better in himself instead of wallowing in his misery, and dare I say it, self-pity. There I said it. It’s out and sorry if I come across as heartless but enough is enough. He will have to sink or swim now, so I think it is best if we all retreat from his room in The Nine of Swords and leave him to figure it out himself. We can do no more here and the rest is up to him. We cannot watch over him, guard him and keep him safe 24/7 so he will have to start taking responsibility for his own welfare. Let us withdraw. There is a dilemma here for we have now reached The Ten of Swords and we are not sure what we are to do or what is happening. It is true, The Sword’s Man had terrible troubles and an unbalanced mind. He was dreadfully worried and afraid he was not safe. Maybe there really were others out to get him and even physically hurt him but it might all come down to hysteria and being a drama queen. Then again, he might just have been looking for attention all this time, acting the martyr or victim, making us all feel sorry for him and his circumstances. It is crazy but some people feed on this sort of attention and lifestyle, constantly sighing and moaning about how cursed their life is. They are constantly in the middle of terrible things happening to them that no one would believe possible. How could one soul have to bear so much strife? we think as we listen to them bleat out their little hearts to anyone who will listen, over and over and over. They have so many stories to tell of the bad luck that has befallen them, and how they have soldiered on throughout, putting up and not complaining!!! If only we had to deal with what they have to, we would know all about suffering! These people are surely due for sainthood, their lives have been so remarkably tortured. So, here we stand on yet another shoreline in The Ten of Swords. At our feet lies a body face down in the sand. We are suitably shocked. We slot into our detective mode and begin to analyse the scene. The body appears to be male and is fully clothed. He lies with his head facing away from us and his right arm turned backwards and outstretched. Ten large Swords (Exhibit A – possible murder weapons) stick upright out of his back, with one piercing his head. His lifeblood drains away from his wounds into the sand. He is still and does not move. He appears to be dead but we have not checked for a pulse yet as we do not want to contaminate the crime scene, that is if it is a crime scene. We need to find out what he was he doing on the beach? When we had left him in The Nine of Swords, he was in his bed. Was he trying to run away from his problems again? Possibly, for he is facing the water and there is a land mass in the distance. He does have a habit of heading for the sea when things go wrong. He may have had a destination in mind. He may have got very desperate after our departure, and reverting to his plan back in the Six of Swords, the only one he knew or had tried, believed he could escape for good this time and get away from his Swords. Grabbing a red rug from his bedroom (Exhibit B, red rug thrown over body) he made a desperate bid for freedom and dashed from the room. Running as fast as he could he headed for the shoreline. He hadn’t a plan, I think it was more of a spur of the moment thing for there is no boat in sight. Did he think he could swim that distance? It doesn’t matter now for he never got the chance to try. As he ran, his breath burning in his lungs, he could hear the clatter of steel close behind. The Swords were following or chasing him. He took a quick look over his shoulder to see how close they were, and not looking where he was going, tripped on a rock and fell, the red rug fell strewn across his back. Within seconds The Swords had descended upon him and plunged deep within. They pinned him to the ground, preventing any movement at all. He was done for, they had got him held tight and there would be no getting away from them now. The Sword’s Man lay on the sand, badly wounded, his life-blood flowing from his body, the sand stained deep red. It was over and he knew it. The end was coming for him as he lay there, his head facing into the dark night sky and the blue ocean before him. This was the moment he had been running from all his life. He had been trying to get away from his dark Swords for so long it had consumed his entire existence. He knew nothing else of life but the constant worry and stress of his Swords. Lying in the sand, The Sword’s Man has reached his lowest point. He has hit rock bottom, and in a sense it is a relief to him. As he stares out to sea, he notices the water (his emotions) have calmed and he begins to feel the calmness flow throughout his body. He wonders if he is dying and strangely feels no fear. Instead he feels at peace, and so do we, for it is over, the end has come and he is being released from his pain and suffering. He does not have to run anymore, for he has accepted his fate. He has sunk so low, he cannot go any further. Now that his mind is calm, he begins to realise The Ten Swords actually belong to him. He had accumulated them on his journey, one by one. From the corner of his eye he can now see their double edge for the first time and realises all he has missed out on. He had only known the dark blade or edge of The Swords and had wasted all his energy on their negative power over him. If only he had his time over again, he would do things differently, change his approach and attitude, and become positive and optimistic. It is too late for him now for he cannot have that time back. The Sword’s Man lies on the sand waiting for his end to come, surrendered to his situation, and through final surrender has been liberated. What a strange situation? His troubles are over now. The worst has happened and he can now stop worrying about it. Staring out to sea and across to the far land, he wonders what life would be like living there as a normal person? He would love a chance to be happy and experience peace of mind. He stares at the dark sky and closes his eyes to await death. He suddenly becomes aware of a flickering light through his eyelids. Weak and barely alive, he opens his eyes to a dazzling bright yellow light. Above him the sky is still pitch dark, but on the horizon, just over the land in the distance, dawn has broken and the sky is lit up with a deep golden glow. The Sword’s Man thinks he is watching the gates of heaven open to welcome him in and sighs in deep contentment. He is brought back to the present by the twinkling of light out of the corner of his eye. Concentrating on where it is coming from he realises it is the sunlight reflecting off the bright, light blade of his Swords. He is amazed by their beauty and brilliant gleam. Why has he never noticed them before? As the night sky begins to recede and give way to the dawn, The Sword’s Man hears a voice from deep within calling to him. It speaks to him in a clear and precise tone with a steady pace unlike the ramblings he is used to. ‘As sure as day follows night, your troubles are now behind you. You have lived through the darkest hour of the soul and understand now, that sometimes things have to get worse before they can get better. The darkest hour is just before dawn and you can survive that too. That is if you want to? Just like every day is given a fresh start with the dawn each morning, so too are you being given a second chance. You now have an opportunity being handed to you to start afresh, but it is only a small window of opportunity. Once the night sky has fully receded, the day will already have started and the chance will be lost. The dawn is the magical hour for such transitions and you must make your mind up as to what you want to do. You stand at the gateway now, and must choose life or death. Death of course will be the easy option for you for you after all you have been through. Should you choose life, then this time round you must make a determined effort to make it a life worth living. You have hit rock bottom and cannot sink any further. This is your time to rise. The Wheel of Fortune is turning once more. You can get on board and begin a new cycle with all your new-found knowledge and experience behind you. You will be expected to have learned from your mistakes, be more determined to use your Swords wisely, and put them to the use they were always intended for. If that is what you want, then you must reach back and pull each of the Ten Swords from your back. It will take all the energy you have left, but it must be done, if you want to have a chance at living. The choice is yours’. The Sword’s Man doesn’t have to think about it too long for he knows what he wants and can’t believe he is being given another chance. He concentrates on the light side of the Swords, and as he does, begins to feel energy flood through his body. He is amazed at the strength and power returning to his limbs. Calmly but very determinedly, he stretches his right arm back and plucks out one Sword after another. The pain of each Sword releasing wracks the man’s body with pain but he is able to cope with it. As the last Sword is plucked, the pain begins to subside and he rolls over onto his back. He rubs his hands over his body but can find no wounds. The blood has disappeared from the sand and he is overcome with emotion. He slowly kneels up before getting to his feet. Stretching his body he stands facing The Sun and gives thanks for his re-birth and being brought from the dark into the light. He turns to look for The Ten Swords but he can find only one. He understands, he gets it, he realises what is happening. He is back at The Ace of Swords once more but things are different. He hears the faint hum of The Wheel of Fortune turning and knows that his old cycle is over and the time has come for him to start another. Grabbing his bright new shiny Sword, he dashes off eager to begin his journey in the confidence he will get it right this time. After we left The Sword’s Man in his room in the Nine of Swords, we didn’t realise his tormentors were watching our departure. Alone and scared, the vulnerable Sword’s Man heard a noise at the back door. Peering out the window he saw someone trying to break into his house. Terrified and nearing hysteria, he grabbed a red rug from his bed and fled through the front door and away from the house. However, some of his tormentors had been left on guard at the front and saw him disappear down the street in the direction of the shoreline. They called to the others and shared the information. They had a cunning plan. Splitting up, they headed out in all directions and blocked every exit from the beach. They watched the Sword’s Man run and as he reached the water’s edge, they begin to close in. Panting and breathless, The Sword’s Man stopped to catch his breath. He was unsure which way to turn next but then he heard a noise behind him. One of his tormentors has coughed and given their presence away. The moved in rapidly and circled him. In the dark night sky he could not make out their faces. He counted Ten of them and he was surprised. He had thought there to be only two or three he had to be afraid of. The same three who made his life a misery and were always intent on causing him hurt and harm. One had been his partner but had betrayed and hurt him, the other enjoyed taunting and making fun of him on the corridors in work. The third was a debt collector he owned much money too. He had been putting him under constant pressure with threats of evictions and repossession. They were nasty people who used their Swords to hurt and cause injury. But who were the other seven? He knew his enemies but couldn’t account for these people who seemed to be aiding and abetting them, to be in on the act. Each of The Ten drew their Swords and moved closer. The Sword’s Man was surrounded, with nowhere to run. He looked far across the water to the distant landmass, and wildly thought of swimming for it in a bid to escape. As he did, The Sun began to rise on the horizon as dawn broke and flooded the night sky with light. The Sword’s Man turned back to his tormentors and froze. He couldn’t believe it. The rising sun illuminated the face of his Ten tormentors. There, just as he had guessed were the ex-partner, work colleague and debt collector, but beside them stood seven people he thought to be good friends. These were people he had trusted and confided in. Among them were other work colleagues who he had always helped with their workload. They were after his job it seems and had been putting him down in front of the boss when he wasn’t around. He had even had them to his house for dinner. Then there was an actual friend who had known his ex-partner and was supposed to be on his side. It now appeared they were a couple and had been before they even broke up. There was also a neighbour who he now knew had been behind the intimidating letters he had received when he first moved there. He minded her cat for her every time she went on vacation. The worst of all was the discovery of a family member in the group. He realised it was her who had been saying all those nasty things about him to his mother so that she would get the bulk of the inheritance and property. She had turned his mother against him and he had never known why. The Sword’s Man was stung to the core and devastated. He had no idea this had been going on behind his back all the time. Two-faced people with hidden agendas and he had been duped. They laughed in his face and began to push him. As he turned to run, they charged and stabbed him in the back with their Swords. He fell to the ground, wounded and destroyed. He had been betrayed by his friends, stabbed in the back and the pain of their Swords was much worse than his known enemies’ ones. It would be some time before he would heal from this attack and ever be able to trust again. When he does, it will be a fresh start and a cleaning of the slate. For each betrayal Sword he pulls from his back, he will use it to sever the ties with their owners. He will have to say goodbye to some people and let go certain aspects of his life. He will be more careful next time round if not a little paranoid and suspicious. He will have to tread gently. This cycle of his life is over and better times will come. His tormentors will go underground for a while before finding a fresh victim to torment for that it the way they spend their time on The Wheel. We left the Sword’s Man to his own devices in The Nine of Swords because we felt it had all gone on too long, and he might be playing the situation in order to get attention. There was always something terrible happening in his life and we wondered if he was exaggerating everything. We also wondered if he got enjoyment out of playing the martyr or victim role. He was used to us running around after him so when we just upped and left in the Nine, he was probably taken aback by the suddenness of it. Feeling sorry for himself and sulky, he stumbled from the bed and did his usual weak, shuffling walk that used to make us all cry out ‘take it easy’, ‘don’t push yourself’, ‘you should have called us to help you’. His usual replies usually followed ‘Oh but I don’t want to be a burden to anyone even though my pain is worse than you could ever imagine’, ‘don’t worry about me, I can fend for myself, ohhh, ouch, don’t worry, it’s nothing, just my usual horrific pain’, ‘you go on your way now and enjoy yourself, don’t be thinking about me at home on my own, sure that is my life now’. God! With no one to watch his dramatic, martyr to his suffering theatrics, and no one to tell about the most recent awful thing that happened to him, he became needy and annoyed. He hatched a plan to make everyone feel full of remorse for leaving him on his own and not giving proper acknowledgement to all his suffering. And so, he wrapped the red rug around himself and headed out the front door and down to the beach. Dawn was breaking and he knew many early morning walkers would be out with their dogs or even jogging. He would not be alone on the beach and there was bound to be an audience. Down on the shoreline he waited and it was not long before he saw a man and woman walking towards him in the distance. A dogs chased ahead of them. There were plenty of rocks on the beach. He found a particularly lumpy one and walked towards it. Sticking his toe under the rock he flung himself to the ground and began to moan as loud as he could. He stared down the beach in the direction of the approaching man and woman who were now running. Great, he had been seen and continued to moan. The dog reached him first and proceeded to lick his face all over which intensely annoyed the man. The couple arrived panting and breathless, but full of concern. ‘Are you alright’ they asked at the same time. In a weak voice, The Sword’s Man put on a good show. ‘Its the pain, I felt weak and then I forget everything else. I must have fainted’. He closed his eyes and grimaced in pain. The woman clucked around him while her partner called the Emergency Services. They asked him what he was doing out on his own at this hour of the morning? He told them he had been left alone and needed to go for a walk, as being stuck in the house all day in pain was terrible. He had thought he would be fine but didn’t realise he was so weak. They ask if they can call anyone for him and in a weak, moany voice he tells them he has ‘no one, no one that would be interested and doesn’t want to be a burden on anyone’. The couple are horrified that this Sword’s Man had been left to fend for himself in such a state. His family and friends should be ashamed of themselves. It was lucky they had been out walking their dog so early, otherwise God knows what would have happened. The Sword’s Man is pleased. He now has a new audience to share his victim and martyr stories with. He begins and they sit listening to the litany of misery and disaster in his life. What a brave man to shoulder such burdens they think. As the Man regales them with one story after another, Swords begin to appear sticking out of his back. They continue to pop up until there are Ten. The man and woman are horrified at the sight. They ask him again if they might call someone for him. The Sword’s Man has second thoughts. ‘Well there might be a few you could call for me’ and quickly lists off the names and numbers. The woman grabs her phone and starts dialling. We are all in bed when our phones ring and we jump with fright at the sound of them. As we listen to the drama on the other end of the phone we inwardly groan but quickly get dressed. We get there before the Emergency Services arrive and take in the scene. There he lies, the moaner and whinger, with Ten Swords sticking out of his back. It is a bit over the top we think. This is certainly overkill, why Ten Swords when we could have done it with just one? He is obviously trying to make this as dramatic as he can, the same as usual, and we are all fed up with it. A drama queen to the last. We don’t look suitably concerned and the woman and man are quite cool with us. ‘He could have died out here’ they accuse us. We take a closer look at the Man. Dismissing the comments of the couple, we demand of him ‘what is it now? what is the matter this time? What are you doing out here? What is supposed to have happened to you now?’. ‘He fell over a rock’ the woman says as she points to the offending stone on the ground. ‘then as he was telling us all his terrible woes, these Swords appeared and we didn’t know what to do’. ‘So he fell over a stone, did he now?’ we all respond. ‘And even though he is weak, he had enough strength to tell you his life story? we question ‘ ‘we wonder how that happened?’. We kneel down on the sand and examine the man who keeps taking sneaky looks out the side of his eye at us. ‘What is supposed to be hurting him the most’ I ask of the woman. ‘He says it is his toe’ she now realises she is beginning to sound silly. ‘so he sucked you in too with his tales of woe. Don’t worry, he does it with most people, even us’ I assure her. Lifting my phone, I call the Emergency Services and cancel their call out. Then we all get together and begin pulling the Ten Swords out of his back. ‘Ouch’, he cries out ‘that hurts’. ‘Well you deserve it’ we cry. After the Swords are all pulled out, we throw them into the sea and tell him that enough is enough, and he will not be using those anymore to get his way or attention. ‘Now that you have no Swords, you will have to wait and see if you will be given a new one. If you do, you had better not start a repeat of using it like you did the others. Now, get up off that ground and pull yourself together. Stop the moaning, the whingeing and boring everyone with your tragedies. No one wants to hear them anymore, so it is time to get a life. A new day is dawning and it is time for you to start over afresh and learn to live like we all have to. We take the good with the bad, the ups with the downs, and try to keep positive. You had got so used to bad things happening and so negative in yourself, you began to draw those things to yourself. You became a victim and adopted the role quite easily. You will find now that I have flung those dull Swords away, your mind will have room for some new light energy. Now go back to your house on your own. Get showered, dressed and open the curtains before going for a proper walk on the beach to get fresh air. If you do meet someone and stop to chat, speak about the lovely day it is and how great it is to be out and about. You will no longer be able to get away with the way you have been behaving up to now for no one is interested anymore, and you are missing out on so much good stuff in life. As The Sword’s Man heads back up the beach, on his own, he discovers a shiny new Sword sitting on his doorstep. He lifts it carefully and carries it inside. The Figure in the Nine of Swords we discover could not sleep and was miserable because he had severe back pain. After the worst night of his life, he heads off to visit an acupuncturist/osteopath who has his practice down near the beach. He has to lie very still while the therapist puts several pins in his back and manipulates his vertebrae. He had tried everything else to fix his back and had come to the end of the line ,and his tether. He has heard great things about this therapist and his success in treating back pain. He is hopeful this might be the way forward for him and an eventual release from the ongoing pain and discomfort. The Sword’s Man just wants to get on with his life. We wish him well and hope the acupuncture or osteopathy works for him. After concluding our forensic analysis of the scene we realise this is actually a crime scene. The man was obviously assaulted by some villains or thugs. A violent crime has been committed and we need to inform the police and emergency services right now. Psychologically distressed after all he had been through, The Sword’ s Man could not go through another Nine of Swords night of misery. In a dark place and even darker mood, his mind has fragmented. All attempts and efforts made to find a way out of his situation or state of mind may have failed. He may be on the verge of a total mental collapse or breakdown and needs professional help immediately. In the worst case scenario, he is not able to go on any longer and decides to take his own life. So, there you have it. One way or another change is coming for the unfortunate Swords. The change this Card brings is often very hard to deal with and can be shocking and upsetting. However, this Card is not all darkness and gloom. When it appears it is acknowledging that your situation cannot go on any longer and that something has to give. When it does, it may be dramatic and painful, but understand it had to happen. For the Swords Figure in this Card he has reached the end. Major changes may have occurred in rapid succession and many aspects of his life swept out to sea, never to be seen again. He may feel destroyed and try desperately to rail against these changes, wanting to hold onto his old way of life, but the more he struggles, the worse it will be for him in the long run. If he can let his mind settle, he will understand that it is time to let go, time to say goodbye to an area or areas of his life. Psychologically he is going through a major transition and will feel very unsure of himself and where he stands. Everything will feel strange or alien to him. He will experience instability and insecurity but if he can just accept this as part of the process of major transformation he may find it interesting to observe and his passage will be smoother. This is a process we must all go through and not be terrified of it. For the Swords, they now have reached a turning point in Card Ten. They have gone so low, that the only place they can now go is up. The Wheel of Fortune is turning once more, and if they can find the patience, the rewards will be great. If they are willing to let go and allow the necessary changes to take place, what will be delivered in return will be more than they ever expected. There is a new dawn on the horizon and a new life and way of being beckons. The worst is behind them. Surrendering does not mean failure, but is understanding what is best for you in the long run and embracing it. Know that all will be well and the sun will come out once more. Like all the other Tens in the Minor Arcana, The Ten of Swords deals with endings and beginnings. 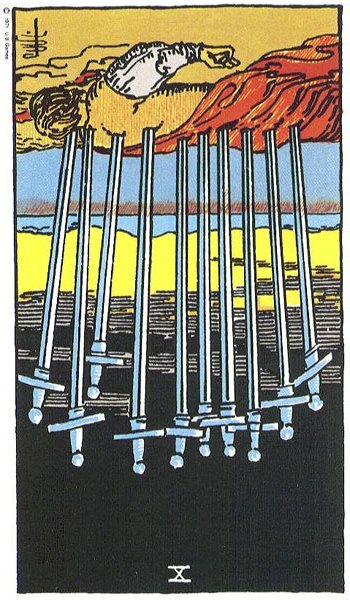 However, the ending aspect of The Ten of Swords is very often extremely painful or catastrophic. This Card can often suggest that you have come to the end of the road with your situation and like ‘the straw that broke the camel’s back’ you may no longer be able to cope. There is a possibility that all you have worried so intensely about has now come to be. It may no longer be in your head anymore but an actual reality you are being asked, or forced to face. It may be too much for you to take in, or deal with. The Ten of Swords often indicates that you have ‘hit rock bottom’. You are bound to be feeling very low and swamped with despair and hopelessness. This is generally not something that has happened overnight, but rather an accumulation of stresses, problems or conflicts. It is also unlikely to be coming from just one source. The Ten of Swords appears when you feel overwhelmed by your situation and have lost the ability to sort out individual issues, even the most simplest of them. This Card cuts you off at the knees and pulls the plug on your physical and mental energy. Suffering from Chronic Fatigue, you may be unable to carry out your everyday tasks. This Ten can lay you very, very low and leave you feeling paralysed, and incapacitated in mind and body. It is doubtful you will be able to think straight under the heavy weight of its energy. You may have been trying to cope for some time but it has spiralled out of control. Sometimes it takes you having to literally collapse from the strain of all yours stresses and worries, before you realise how bad things have got and admit something has to be done. We often presume the body is like a robot or machine, and just because we want it to keep going, it will. Few of us realise that is has its limits because we have never had to face them before. We often run around shouting ‘I can’t take anymore’ or ‘I can’t cope with this any longer’ but mostly we don’t mean it and is all forgotten once the issue has passed or has been addressed. The effects of chronic stress or worry is another matter altogether. Each of us are born with a genetic stress or coping threshold. The coping threshold for prolonged exposure to chronic stress or conflict varies greatly. Some of us seem to have amazing stamina to deal with all types of crisis and traumas, while many of us crack after our first main exposure to stress. It often happens that those experiencing chronic psychological stress live dangerously close to their coping threshold, and once nothing major happens on top of what they are already dealing with, appear to get by and live quite normally. It is only when something new happens, a different type of stress, affecting them or those connected to them, that their threshold is breached. It can be something small, seemingly irrelevant, or possibly major, but certain buttons have been pushed. This brings them out of their usual comfort zone of stress and into unmanageable territory. Their already low serotonin levels stagger and their overworked, exhausted adrenal glands crash. To those standing by watching, they may be confused at the level of reaction to what they consider to be, not so big a deal, but for the physically and psychologically collapsed person, as silly as it may seem to others, it is the final nail in their coffin. Once that threshold is crossed it’s not possible to quickly jump back over it. Crossing the stress threshold has a knock on effect on every area of the body. Crashing fatigue hits and saps every ounce of energy out of you, insomnia or sleep disturbances kick in, muscles and joints ache for no apparent reason and migraines plaque you. The simplest of decisions or having to plan anything becomes a major deal, or may not be possible at all. Appetite either increases or decreases. Noise seems to be extra loud, and leaves you in a constant shocked state with your heart pounding long after the noise has gone. Palpitations, breathlessness and serious weakness leave you panicked and distressed. Emotionally low, you find everything sad and are deeply disturbed by tragic stories in the newspapers or on tv. People, try to rally you around with suggestions of a night out, or trip away to take your mind off things, but the thoughts of even having to get washed, think about what to wear, or pack a bag, is a step too far. No one quite understands the type of tiredness you have when you say you feel exhausted. They talk of getting a good night’s sleep or going for a walk in the fresh air, but you have gone way too far for either of those to having any real lasting effect. Socially you become a recluse and will avoid answering the phone or doorbell. You are a mess and something has to be done. The Ten of Swords has done its work and pinned you down to the ground. It is very hard to see a way out of this and extra distress is heaped upon your existing burden, because even with the best will in the world, you are unable to do anything at all, which stresses you even further. But let us not be all disaster and gloom. You may feel you have fallen into a black hole and do not know or have the energy to get out of it, but when The Ten of Swords appears it brings hope and light out of the darkness and misery. It speaks of now having an oppportunity to sort yourself out. It may not have been obvious to others before, because you were coping, but the recent turn of events has left no one in doubt as to how bad things have got for you. You can collapse now in peace as the struggle is over. Just let it happen now for this is something that has been coming for a long time. The contrast between the dawn breaking on the horizon in this Card and the dark black sky is symbolically letting you know that no matter how bad things have got for you, there is now hope and the possibility of solutions to your problems, help and healing. Peace is on the way and an end to suffering. However, you cannot just lie there and expect it all to be done for you and to you. Recovery depends on your letting go of and saying good-bye to the way you have been living and coping with things. Change is needed on every level for you, as what you have been doing up until now has not been working. Old mindsets, attitudes and perceived notions about things or people will have to go, allowing fresh positive and optimistic energy to fill the vacuum. You may have to finally let go of stale or unhealthy relationships, so-called friends, a job that has been running you into the ground or a business that is beyond saving. You have been struggling to hold onto a way of life that has been systematically killing you. You must also let others in to help, you need to be open about your problems or issues and communicate your feelings. People cannot help if you keep them in the dark and try to cope alone. Professional help may be needed such as doctors, counsellors or psychotherapists. Offers of support from family and friends should be gratefully accepted, for everyone wants to help you recover and see you back to your normal self, happy and full of life. You will have to take it easy, get plenty of rest and find a way to learn how to relax. Taking up yoga or meditation might have long-term beneficial effects on your health. Gentle exercise will be needed to restore strength to your overwhelmed mind and body. Unfortunately, when The Ten of Swords appears, the worst may have happened. It can bring ruin, disaster, catastrophes, dreadful misfortune and ill-health. The associated pain and distress of such events may leave you shattered and destroyed. You might feel like you have lost everything and that your world is at an end. Defeat and failure bring you to your knees. You have reached a low place indeed and may feel isolated and terribly alone. You are close to giving up the will to live, and may wonder what life is all about if it has to hurt so bad. The Ten of Swords always supplies us with victims and you may be feeling like one right now. You may feel cursed or blighted by bad luck and misfortune. You may believe you have been singled out by the Universe for particularly harsh treatment and ask ‘why me?’, or ‘what have I done to deserve such bad luck?’ or ‘I must have been terribly bad in a previous life cause I’m definitely paying for it now’? You may feel that no matter which way you turn it’s blocked or whatever you attempt to do fails. You may be throwing your hands up in the air and crying ‘ I give up, what’s the point in trying anything anymore?. I might as well give up and die’. It is more than likely true that the Gods are not shining on you right now, but you are not the only one. It may appear that you are getting more than your fair share of disasters but it is important to understand that we all go through times like this, when the universe seems to be conspiring against us. When we bring The Wheel of Fortune into the picture, we can see that it is constantly moving. As The Wheel rotates, those who have been enjoying their time on the ascent and reaching the top, now begin to move in the downward turn. Their luck, good times and everything falling nicely into place for them may begin to dissipate as The Wheel turns. Their circumstances may appear to take a turn for the worse. Those who have been descending, or have spent time stuck on the bottom, begin to make their ascent once more and will see an upturn in their circumstances. Life moves in cycles but there are ebbs and flows during that time, and nothing is constant. When things are going in our favour it would be truly magical if we could keep it like that, if we could stop The Wheel from turning just where we want it to be. Alas, we all want the same and our first time stuck on the downward turn, or crushed underneath it, can be a harrowing experience. We may think The Wheel is stuck, never to turn again, but as sure as night follows day what we are experiencing will pass and slowly but surely we will make our ascent once more, our luck will change and things will begin to happen for us once more. If we can be patient, observant of this process and understand the nature of it, then the next time our downward turn comes upon us, we will be able to weather the storm instead of being swept away by it. Rest assured that no matter how bad things may seem right now, understand you have reached the lowest point. Things can’t get any worse for you now, because that has already happened. You have only one way to go now and that is up. You have reached a turning point and although you still feel you are in the dark and quite hopeless, light is on the way and there will be the first signs of circumstances improving for you. It is important to never lose hope or faith in life when everything is grim and black. The only way you can be a victim is if you constantly expect to be one. It is then you become a magnet for negativity and pessimism. Know that whatever you are going through at present will pass, just like The Wheel turning, it will move into the past and be put behind you. Don’ let this break your spirit for there are much better times ahead. You must maintain a healthy outlook on life and not let recent occurences sabotage your future happiness. 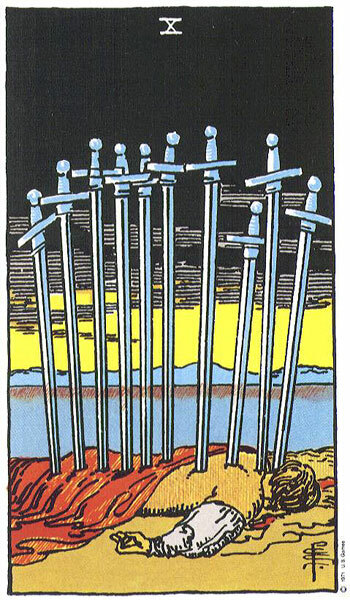 The Ten of Swords also brings melodrama and we can’t help but feel the figure lying on the ground looks a bit pathetic with so many Swords stuck in his back. Talking about overkill, he certainly gets Ten out Ten for effort. Someone may be playing the ‘good old martyr’ or ‘victim’ role in your situation. Two Swords sticking out of their back isn’t enough for them to portray their suffering or catch your attention. No, they need Ten Swords to play on the sympathy of all. This Card represents the person who is always moaning and whingeing about their life to anyone who will listen. If you are unfortunate enough to get trapped beside one at a dinner party or social occasion, then you will find it hard to get away. They have story after story to tell you about how tragic their life is and what they have to put up with. If there is a victim or martyr person in your situation, they may be making life quite difficult for you. Emotional blackmail may be used to keep you under their control. They possibly have an underhand way to make you feel guilty when you attempt to go out, enjoy yourself or go on vacation. Comments such as “poor me”, “isn’t it well for you?” and ‘don’t worry about me, you go and enjoy yourself. I will be fine all here on my own’ make you inwardly cringe while guilt and resentment eat you up inside. It is up to you to change this scenario by putting your foot down and making it clear to them you know what they are up to and won’t stand for it any longer. If the victim or martyr receives much sympathy and attention as a result of all their Swords, afflictions and crosses they have to bear, you will have a hard job getting them to drop their act. It may be best to back out of the situation and leave them to it, otherwise your life will be blighted by their constant demands. When The Ten of Swords appears, it is certain that major changes are occurring in your life and possibly at such a rate or force you no longer know who you are or can be sure of anything anymore. You may have lost the constant landmarks in your life and do not know which way to turn. It is quite possible that you have been desperately trying to hold on and resist these sweeping changes but even though you do not see it right now, it is best to let go and give in. You must resign yourself to what is being taken away and give up the struggle. Life is changing for you and it is best to let go and trust that is all for the best. It indicates the death of a situation prior to the beginning of another. It may be the end of a relationship, collapse of a business or friendship. It is time to move on. Acceptance to the death and the changes it will bring is key here. Your thoughts about life have brought you to this place and new beliefs can take you out of it. The Ten of Swords has been traditionally associated with betrayal and attack. Betrayal could come from close quarters or from people you thought you could trust. Because The Swords are associated with the spoken word, The Ten of Swords can suggest that someone is bad-mouthing you or bitching about you behind your back. You may feel stabbed in the back by a friend or friends after discovering treacherous behaviour. You may not know who you can trust or confide in. Individuals or groups may be working against you, making your life difficult or have it in for you. You could be the victim of bullying or harassment. This Ten of Swords can also suggest that you are letting people walk all over you, leaving foot prints on your back or wiping their feet on you as they go. It is time to put an end to such treatment and stand up for yourself by speaking out and objecting. On a more aggressive level, The Ten of Swords can also be associated with violence and aggression. There may be the threat of physical attack or assault. Injuries or worse could occur. Criminal activity may be involved. When this Card appears it can be a warning that you do not take your personal safety seriously enough. You may be taking unnecessary risks or exposing yourself to danger. Walking home alone from a night out instead of getting a taxi is taking a risk, so to is getting separated from your friends on an outing or accepting a lift home from someone you have just met. The Ten of Swords brings ill-health of all kinds and not just psychological woes. However, it is particularly associated with the back. It can highlight a chronic back problem in a Health Reading or be suggesting acupuncture to treat health issues. The Ten of Swords is one of the Cards that when found together in a Reading can suggest Physical Death. Remember, on its own or even when a couple of other negative Cards are involved, it does not necessarily mean death. The Ten of Swords can indicate a sending or receiving a forceful message. Let you be in no doubt about the sender’s intentions as they drive their point home. The Ten of Swords can signal the death Knell for Relationships. It might be time to let go of a relationship that has not been working for some time, is full of conflict or stress, or has brought you unhappiness. It is more than likely dead at this stage and you need to learn to accept this in order for you to move on. When it comes to your relationship you may feel like you have been flogging a dead horse and now realise there is no point in continuing anymore. This is bound to be a very stressful time for all involved. The final stages of it will be very painful but must be endured. Remember, that in order for new doors and opportunities to open for you other doors need to close. Time to say goodbye and move on for there is nothing more to do here and nothing can be achieved. There will be immense relief and release when it is all over and done. Look to the Reversed Ten of Swords for the possibility of a once thought dead relationship coming back to life. If in a violent and abusive relationship The Ten of Swords can be a warning that your life or personal safety may be in serious danger. Issues and conflicts may have come to a head or are at boiling point. A tense situation could get out of hand and someone may lose control of their senses. Rage and anger may be explosive, resulting in violence and assault. The outcome may be extremely nasty and someone may get injured or worse. There is also the possibility of treachery and betrayal by a partner or spouse when The Ten of Swords appears, but again other Cards will need to concur before jumping to conclusions. Your partner may be seriously bad mouthing you to others or family members if they are seeking a way out of their relationship. They may have the potential to turn everyone against you, and are setting the scene for you to take full blame. In a Relationship Reading, depending on the situation and surrounding Cards it may be highlighting the fact that your partner is ill or is laid up at present. There may be ongoing treatment and hospitalisation, which is causing stress and worry for both of you. Depending on surrounding Cards it can highlight the sad fact that your partner or spouse may have died. Work-wise, The Ten of Swords is not a welcome Card. There may be terrible conflict, stress or bullying in the workplace. You may be overloaded with work and can no longer cope with all the pressure and deadlines. This Card can also suggest that someone has it in for you in work, or is saying things about you behind your back. Everyone seems to have their own agenda and may be quite ruthless in how they go about achieving it. There is obviously a lot of mental stress in your job and possible information overload. You may have been struggling to keep on top of things but something has happened to make you snap. There is a chance of a work-related breakdown or having to take time off from work to recover from chronic stress. It is time to re-think your whole career for it is making you ill and very unhappy. You may be forced out of your job because of ill-health or had an accident while at work. It is time to let go and move on for your job or career choice does not suit you. Have a good rest before making any decisions. It may be time to let go of a business that is not working. Business failures, major losses and ruin can accompany The Ten of Swords. You may have collapsed alongside your business and have lost everything. You have struggled as much as you can to keep it afloat but now must make some painful decisions. All may not be lost as the dawn breaking on the horizon can suggest starting over again. However, this Card can suggest that you have been working with out-dated methods and poor planning. Doing things the way you always did, or the old way, will no longer work. You will need to bring yourself up to speed on modern business and technology, along with some fresh ideas and realistic plans. There is also the possibility that you are not suitable for running your own business. You may not have it in you to cope with all the stresses, worries and responsibilities that being self-employed brings. Career-wise, you may be working as an acupuncturist, chiropractor or osteopath. You may be a crime scene investigator or working in forensics. When The Ten of Swords Reverses several scenarios may be suggested. It is vitally important to consult with the surrounding Cards and communicate with The Querant as it can have quite negative implications both Upright and Reversed. The Reversed Ten of Swords can indicate a release from a stressful situation, not being able to or not wanting to free yourself, or that regardless of how low you think you have sunk, you will still have to hit rock bottom before things will improve. As The Ten of Swords turns on its back, so too does the body lying in the sand. It now moves to the top of the card instead of being at the ‘rock bottom’ end. When this happens, the force of gravity takes over and the heavy Swords begin to loosen their hold in the man’s back. Their sheer weight pulls them out, and they fall away into the dark oblivion below. The man feels the burdens lift or fall, one by one, and realises he is now free to move. He is no longer pinned down and begins to rise above his problems. The dark night sky also begins to recede and in its place The Sun rises on a new dawn. Hope, Recovery and Rebirth. The Ten of Swords Reversed can bring eventual release from terrible stresses, conflict or torment. Release will not be instantaneous, but it will be enough of a lightening to allow you have hope once more. The Sun now rising above the dark when The Ten Reverses, symbolises solutions being found or help appearing on the horizon. You are no longer alone when this Card Reverses as others have come to help you from your plight. The worst is behind you. The bright sky now more evident signals recovery and a fresh start as darkness recedes. You have survived and the worst is now over. Liberation and freedom replace woe and despair. As The Swords fall from the back of the lifeless man in The Reversed Ten of Swords, the soothing blue waters of the ocean gently bathe his wounds, and instead of the rigid and unyielding pain of the sharp Swords (worries, stresses, conflict), he now floats peacefully in the tranquil waters. This suggests that a sense of peace and harmony is being restored and the rawness of your situation is easing. Any turbulent emotions will begin to calm, and when that happens, you mind will stabilise and begin to refocus. With the intensity of your situation beginning to dissipate, you can now see light at the end of the tunnel and the recovery process can begin in earnest. However, we must always remember, The Ten of Swords whether Upright or Reversed is never going to be easy, so even when it reverses, the way forward for you will not be smooth and easy. The release offered by this Ten Reversed is often temporary. It can present itself, like the strip of yellow light in the imagery of this Card as a small window of opportunity. Something has happened to create this opening, or there is the possibility that someone has thrown you a lifeline. There may be very little time to think it over or consider your options. In fact this might be the only option you have, but are you willing to take it? When you have been laid low for so long, being so overwhelmed with all your issues, worries or stresses, it can be hard to think positively or have any faith in finding a way out. Chronic fatigue may have you lacking in enthusiasm and you may feel too low in energy to motivate yourself, but this Card is telling you to act fast if you want to get the benefit of it. There is no guarantee though that it will work and you may just be putting off the inevitable. You must try though and not just give in to failure and defeat. It is up to you now to pull yourself together and take a good look at your life. Change and a release of old attitudes and beliefs are essential if you are to make the most of this chance. No one can do it for you. You must learn from what has happened to you so as to make sure it never happens again. Otherwise like the Figure in the Ten of Wands, you will find yourself back in the same position somewhere in the future. Look back to the Nine of Swords Card. Do you really want to live live like this? This is your chance now so reach out and grab it with both hands. Unfortunately, The Ten of Swords can indicate the terrible scenario where the situation or person involved is beyond help. All efforts to find a solution or release have failed leaving a sense of hopelessness and despair for all involved. This can be down to a person not wanting to help themself and making it difficult or impossible for others to. Then again, the worst may have happened. All you feared and worried about may now be a reality. Negativity and pessimism can become intense. You may be resigning yourself to a situation, giving up the fight, the struggle, not wanting to know anymore and not caring what happens from here on in. The weight of all your worries has broken you. There might be total mental collapse. Hospitalisation or admission to a psychiatric unit may be necessary. Depending on surrounding Cards (several swords), there could be concern for the safety of the individual. There may be obsessional thoughts of suicide or death. Returning to the Nine of Swords, severe anguish and delusional thoughts may take over. Mental strength has disappeared. As the Ten of Swords Reverses, the Swords sink deeper into the figure. The surrounding Cards will give evidence as to whether this theory might be applicable. A negative or worrying situation that you are hoping will soon pass may not be quite over when The Ten of Swords Reverses. You may think that things cannot get any worse at this stage and that you have hit rock bottom, but you are not quite there yet. You may have to brace yourself for further upsets or upheavals before your circumstances can begin to improve. Everything has its own cycle, and unfortunately this one may not yet be completed. Don’t let yourself sink into despair. Keep faith and the belief that things will improve in the not too distant future. For some, The Ten of Swords can signify the end of a terrible situation, experience or problem. However, you may be seriously shaken by the events and not exactly be in the mood for celebrations. Celebrations may not be appropriate in these circumstances, especially if the event experienced was traumatic or tragic. Others may have been involved and not just you. Not everyone may have survived the impact of the situation or managed to escape. Fate, destiny or luck may have been on your side, and you may wonder why you have been spared or are still standing? As the darkness of the situation disappears into the background and light appears on the horizon, it may not be as easy for you. Inside, scars of the recent events may remain, some will heal and others will remain as a constant reminder of what you have just come through. You may have survived a serious accident or crash and must now begin to put your life back together again. You may also have survived a major catastrophe or violent assault. This Card can also be associated with near-death experiences, especially if The Death Card also appears in Reverse. You might be recovering from a serious illness or have come through major surgery. You must be very careful and take extra care of yourself, for set-backs in recovery, or a return of an old illness can accompany this Card. A chronic health condition can flare up, or treatment for it becomes insufficient or ineffective. Where back problems are concerned, there is the eventual possibility of finding a treatment that actually works. However, because this is a Reversed Card, it can work the other way and become worse. Problems you thought dealt with, or done and dusted may come back from the dead and resurface causing you anguish and distress when this Ten appears Reversed. With the Reversed Ten of Swords, there may come the realisation that you are your own worst enemy and have been self-sabotaging your own happiness. Through Self Help, Personal Development, Counselling or Psychotherapy you may be discovering how your dysfunctional mindsets, pessimism and rigid beliefs have negatively impacted your outlook on life. You no longer want to wallow in self-pity or bore anyone else with your woes. You may begin to lose the victim attitude or refuse to become a martyr for the sake of others. It can herald a time when you refuse to let one more person take advantage of you or treat you like a doormat. You are not there for everyone else’s convenience. You have a life of your own to lead so get up and get going. Strengthen your resolve and be firm with others. The time for self-sacrifice and self-pity is over. A Relationship thought dead can come back to life again when The Ten of Swords Reverses. However, there would need to be supporting positive Cards to run with this interpretation as it is not a welcoming Card to appear in any Relationship Spread. If you have gone through a painful or hostile separation or divorce this Reversed Ten can can indicate you are slowly beginning to recover. You may have thought the break-up of your relationship was the end of the world, and the worse thing that could have happened, but life beckons once again and you have survived. After much dark times and despair you now glimpse light at the end of the tunnel and have faith in better times ahead. It is vitally important to remove and deal with all the Swords (issues) connected to your breakup, otherwise you will unconsciously carry them forward and taint your future happiness. This Card can also suggest the slow recovery process after the death of a partner or spouse. On the other hand, you may not want to move on after a broken relationship, especially if it was not your idea. You may prefer to get stuck in your bitterness and refuse to let go of what is now dead and gone, bemoaning how badly you were treated and how much a victim you had become. You could become negative, twisted and paranoid in the process. You could be maintaining a campaign of hatred against your ex-partner, laying sole blame at their doorstep. Angry words and badmouthing fly from a bitter heart and vindictive mind. The only one you are really hurting at this stage is yourself and you are doing yourself no favours. Professional help may be needed to cut painful ties. The Ten of Swords Reversed can suggest escape or release from a controlling or abusive relationship. The abuse may have had to reach an all time low before any real action was taken. If a way out has not been found, aggression and violence may escalate and get out of control. When this Ten Reverses, the Figure now looks as if he is lying on the Swords or possibly a bed of nails. The saying ‘you have made your bed and must now lie on it’ springs to mind. There is a possibility you have resigned yourself to staying in a bad relationship or marriage, or that others are expecting you to. You may have no allies and no one to turn to when things go wrong. You may have to keep your problems to yourself and accept them. You may have to ‘put up and shut up’. Work-wise, The Reversed Ten of Swords can suggest you have eventually left a stressful or highly pressurised job. Your job may have got the better of you and affected your health. Conflict in the workplace eases or those who instigated the problems have left, or have been removed. However, gossip and slander in the workplace may intensify and hostilities increase. A sinking business slowly starts to recover as you find new ways and new attitudes to replace the old when The Ten of Swords Reverses. A rescue package may arrive or be offered just in the nick of time. This may be your one and only chance to save the business, so make the most of it. If you have been struggling to find out why your business is failing, you may have nailed the problem areas or tracked down those responsible for mistakes or underhand behaviour. On the other hand, your business may have brought you to your knees with worry and stress. You may decide to close up shop or sell up in favour of a more peaceful and healthier way of life. The Ten of Swords Reversed can suggest you are starting over in business again. Make sure to tie up any loose ends from the last one and not repeat any mistakes. Thank so much for your encouraging words. I have been inundated with people saying they didn’t see the Poll and how they enjoyed the Tarotscopes, so in the near future I will endeavour to bring them back. They take the guts of two days to put together and I am also writing the rest of the course so whatever happens there will definitely be a monthly one to look forward to. Yes, I am just a year and a half blogging now and building my site. Going from teaching in a class environment to offering a complete tarot course on-line has been challenging, but as you said I have just begun and with so much done, much more to do still, I have broken the back on it and will definitely be hanging on in there. Hi I wonder if anyone can answer this. I asked if the guy in question will approach me and speak to me and I got the 10 of swords. As swords are usually communication does this mean that despite any friction between us it will become a thing of the past and he will talk to me? Or as 10 swords look like overkill, does it means any means of communication is well and truly over?! Well it could go either way but I would like to think that any animosity you have towards each other up till now will have burned itself out in the 10 of Swords leaving the door open for fresh communication. I think you have probably beaten the issue to death at this stage and both of you need to move past it. This might involve having to agree to disagree, apologise, or offer forgiveness. Obviously there are two of you in it, but there could be a standoff if one of you refuse to back down, give in or give up,and that will lead to nowhere. The strong energy connected to the issue may not be as important as it once was. There is fatigue at this stage and hopefully a determination to move on. Hopefully there will be communication between the two of you, but one way or another, time to let go of whatever has caused all those swords. There could be one last blow out in an attempt to clear the air. Best of Luck! Thanks for the reply! The guy has created all of this tension between us and if he was to approach me now I would really like to have that conversation with him to clear the air. Even though I shouldn’t have too! Like you said I am tired of this and I rather clear the current dysfunctional energy between us! Best of luck. Dragging dead horses around can be quite exhausting!! !